This product was replaced by a updated version SD Card Shield V4.0 (SLD01095P). 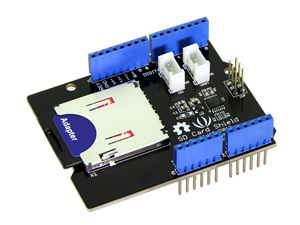 The SD card shield adds storage to your Arduino project. It supports SD, SDHC, or MicroSD TF cards. Use the on-board toggle switch to select the SD card type.And when you want plug a sd card on it,you should select the switch to the right direction. It just uses the SPI ports of Arduino,and you can plug more other shield on it.There are I2C grove and UART grove port on board.